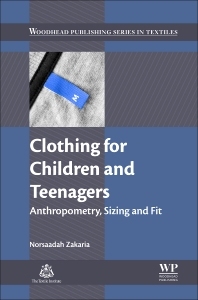 Clothing for Children and Teenagers: Anthropometry, Sizing and Fit addresses the complexities of developing size specifications for clothing aimed at seven to seventeen year olds. Children and teenagers experience rapid physical growth and alterations in body shape as they develop—changes that pose significant challenges in creating apparel sizing systems. The book begins by introducing the principles of apparel fit and sizing systems. Drawing on the author’s own fieldwork, it goes on to discuss methods of conducting anthropometric surveys in children and teenagers, and techniques for analyzing the resulting data in order to produce successful sizing systems. Manufacturers, marketers and retailers of children’s apparel, as well as postgraduate students and academic researchers in textile science.